Wouldn’t you like to look at least 5 years younger than your actual age? One thing in life is certain: we cannot stop time. But who says you have to look as old as you really are? Lots of things show our age and make us feel less than confident in our appearance, but with a little tweaking and some easy style makeovers, we can regain some of that youthful glow and boost our self-confidence. You’ll be amazed at the difference you can achieve with some simple, easy style makeovers involving hairstyles, skincare, makeup and clothing. Freshen up your style and turn back the clock at the same time by following these great tips for looking five years younger with these easy style makeovers. Just because you’ve had the same hairstyle for years and years doesn’t mean it works for you. Lots of women favor the outdated hairstyle they wore in high school and are afraid to make a change. You may think that extra- long hair makes you look young, but if you’ve got any grays (and if you’ve passed the thirty year mark you probably have a few) then your long hair is probably a little unruly, hard to tame, dull and aging. Try a haircut that just brushes your shoulders, and blow-dry smooth with a round brush. Regardless of your hair’s length, gray hair is one of the most obvious signs of aging. Don’t be stubborn and elitist and hang onto the grays out of a misguided sense of pride. Use a semi-permanent hair color that’s a shade darker than your natural color. It washes out within a couple of months and as it fades the grays just look like highlights. Loose the grays and you’ll lose a few years off your appearance at the same time. Sun damage, stress, poor skin care habits and lack of sleep all combine to make our skin look dull, dry and older. Start turning back time by establishing a better skin care routine. First, exfoliate. You can use a natural, home-made exfoliating scrub made from one whole papaya and a tablespoon of dry oatmeal. Blend in a food processor and then smooth onto your face. Let it sit for about ten minutes and then use a damp cloth to scrub off with circular movements. A papaya facial peel can help diminish acne marks and smooth away wrinkles. After exfoliating, you need to moisturize. As we grow older it becomes more difficult for our skin to retain moisture, and dry skin is another obvious sign of aging. Use a daily moisturizer with sunscreen to help plump up those wrinkle lines and bring a youthful glow to your skin. Under-eye concealer: Apply a touch of a light colored under eye concealer. Dark circles are a certain age indicator, but highlighting the skin beneath your eyes makes you look younger. Blusher: Shade your cheekbones with a touch of rouge in a complimentary color. Pink for fair skin, bronze for olive toned skin, etc… Avoid dark colors and be sure and blend, blend, blend. Lipstick: Make sure your lips are smooth and moist by exfoliating with a dab of honey and baking soda. Then use a brighter, lighter shade of lipstick than you would normally use. Try a shimmering pink lip gloss or a natural lip stain. Regardless of your size and shape, wearing clothing that is too tight or that is too loose and sloppy will make you look old and dull. Get an honest opinion from a sister or girlfriend, and don’t shy away from your mirror. You know if those pants are too tight and show your tummy bulge, and you also know that a mumu or other shapeless, baggy clothes are never flattering. Be realistic about your size when you are clothes shopping, and remember to accentuate your best figure assets. If you have a nice bosom, show a little cleavage (not too much), and if you have shapely legs, choose a shorter skirt. Clothes that fit your body properly will help you look younger and improve your confidence. 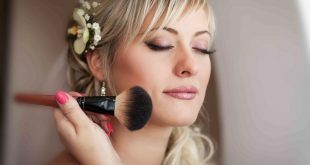 The best style makeover tip you can get is to introduce some color into your wardrobe, hairstyle and makeup. As we age our skin tends to lose its color. Our lip color fades, our skin tone becomes more pale, even our eyes get lighter. The easiest style makeover tips for looking younger involve color. If you tend to wear black or neutral shades most often, then buy yourself a red blouse. If you normally wear clear gloss or chapstick, get a beautiful bright-colored lipstick. Want to take it a step further than hiding grays? Try on a new hair color with a wash-in/wash-out temporary hair color. You might find that your inner redhead has been waiting to shine for years. Look for colors that say “Fun!” and “Young!” and don’t be shy about bringing a little color into the picture. Use these simple, easy style makeover tips to give yourself a fresh new look that will have you looking five years younger in no time!